I was among the 10 000 Color runners who were unleashed in the Pretoria tour at the Waterkloof Airforce Base last weekend. 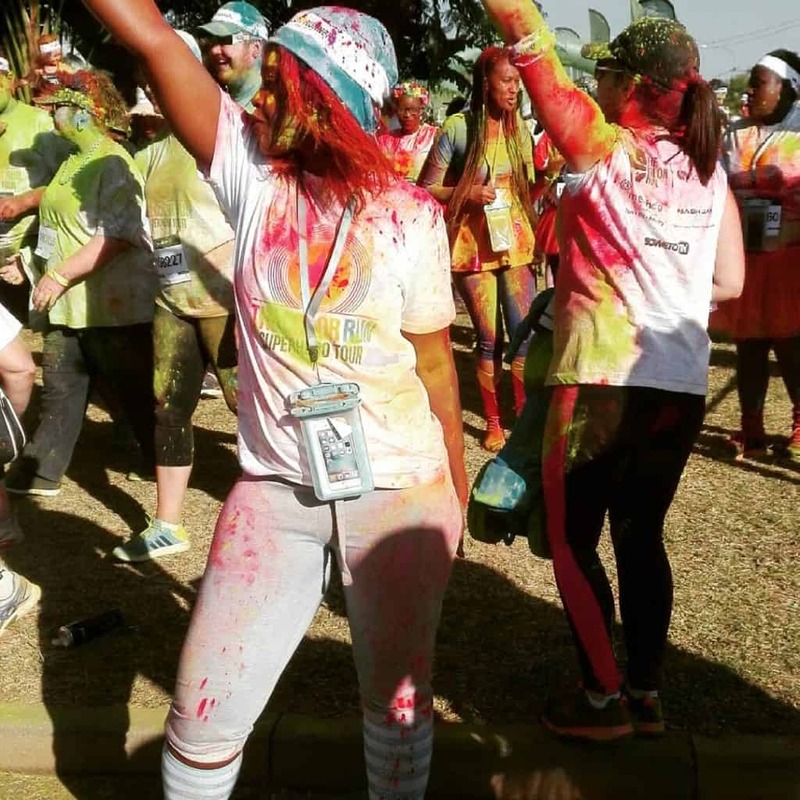 While the Color Run unleashed us on to the Pretoria streets, we unleashed our inner superheroes onto the streets. Going by this statement, I can claim that it was actually 20,000 of us who attended the event- every 10 000 of us plus the inner superhero, that makes 20 000 right?! 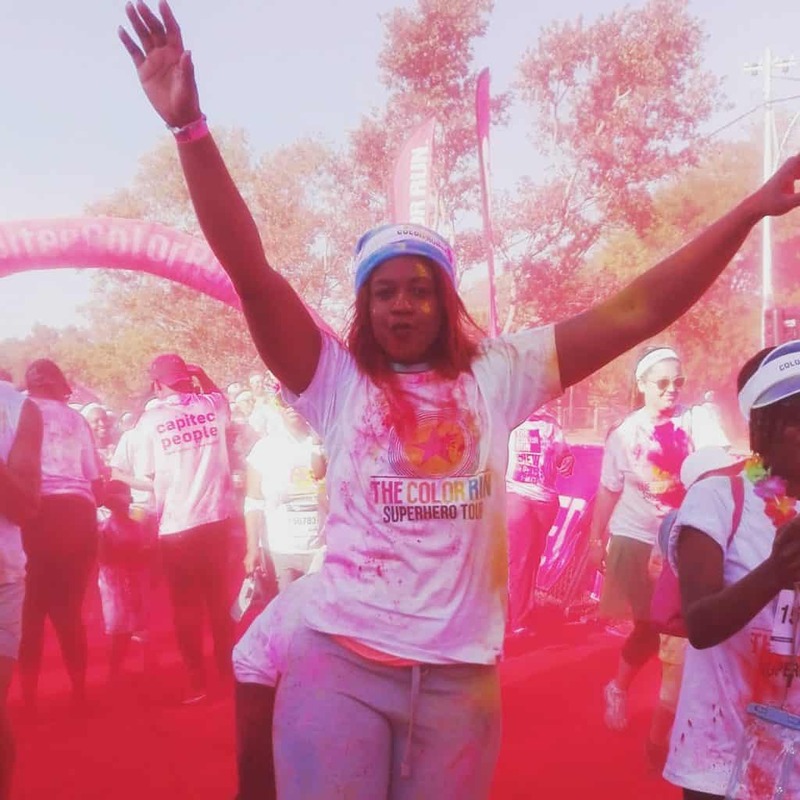 I do not know about you lot, but this was my first ever Color Run. I have been to so many races but this one truly beat all others. I could lie to you and say it was because I was so excited that I ran my fastest time ever. Or I could lie to you and say I experienced the ‘runner’s high’ all the way from the start to finish line. The truth is I did zero running during this race. Nada. Zero. Zilch. I could go on about how complete strangers were dousing colour on each other, but I guess you get my drift about the chain of colourful fun that was involved or is involved in a Color Run. So you see, if you are an uptight human, the Color Run really isn’t for you. Anyone of any age can take part in the Color Run, no matter their level of fitness because there is very little running involved. Of course, there were a handful of people who ran the track, but the rest of us just walked. This was not because we couldn’t run. We could. We just chose not to in order to prolong the fun. Besides, the race is not timed, it’s just 5 kilometers of pure bliss, and however, you want to do it. Yes, crawling is also allowed, in case you were wondering. 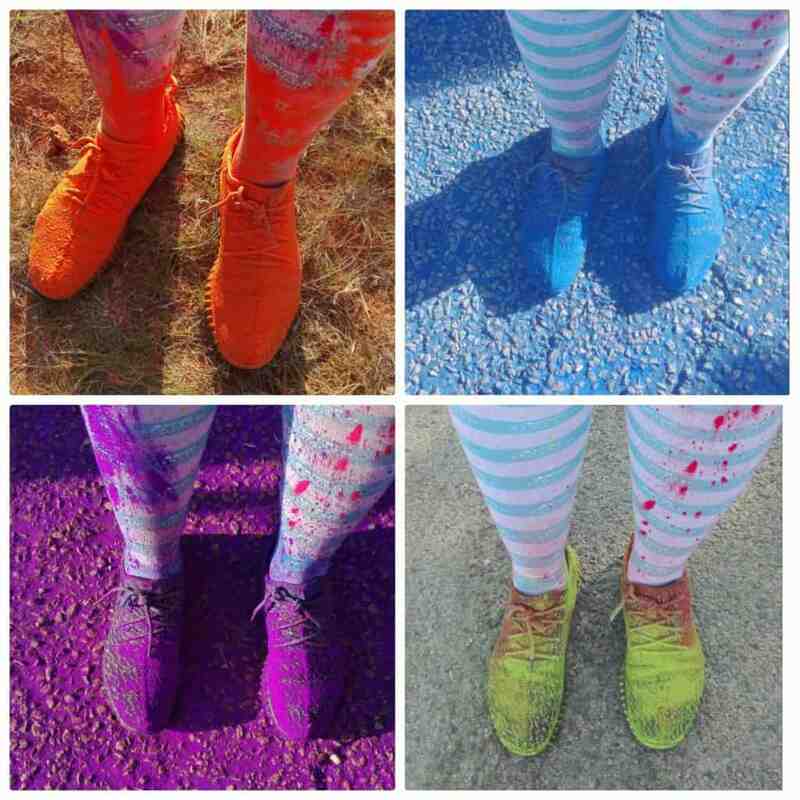 Between the start and the finish lines were five different ‘colour dousing station’, red, blue, green, purple and orange. The stations strategically had colours of the event sponsors such as Capitec Bank, who are the headline sponsors. My shoes pictured below are evidence of the superb stations. 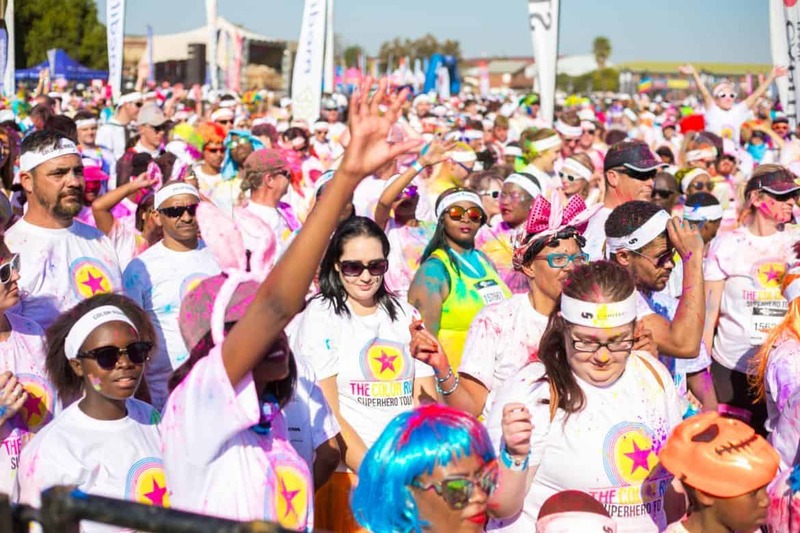 There were ‘runners’ young and old dressed in spandex, capes and masks celebrating their inner hero and the race, there was the Finish Festival equipped with music, dancing and massive colour throws, which created millions of vivid colour combinations. The South African tour is still on the way and it may be headed your way. Check out the Color Run website and join the awesomeness. *My kids and I were given media access to the event. All opinions are mine. Wow this looks like so much fun! Love the pic of you all jumping up in the air! Sounds so much fun, I would love to take part one day. We have a color run in my city. I will have to check it out! I love the different pictures of your shoes changing colors. So FUN! That looks like a lot of fun. I would probably be the one crawling and we’re talking about after 5 mins. I definitely need to take part in a color run someday. Lol it does look like great fun. I love the colours it looks so pretty too. I’d probably be crawling lol. I wish they had something like this near me. It looks like it was a ton of fun. Even if I were running, I would still stop to throw on some color. This looks like it was a lot of fun! It’s neat that you pointed out that you don’t have to run to take part in the event. I’d SO love to take part in a Color Run someday. Hopefully sooner than later! It seems like so much fun, and countless memories created! The color run looks like a blast! I have always wanted to take part in it but never worked out with other pre-scheduled engagements. I should definitely check it out when it is in town next though! I’ve never done the color run! Your photos make me want to though. I’m going to check it out next time its in my city! We love the Color Run! We’ve participated in it a few years but now that our daughter is old enough to run with us, I’m very much looking forward to the next run in Arizona! A color run is at the very top of my bucket list. Thank you for sharing your experience with it. I love how everyone just let’s go and has fun! Looks like a wonderful time! I’ve always wanted to do a color run! I feel like I’d be so excited I wouldn’t even think about the running! I’ve always wanted to do a color run! For sure a bucket list item. I love the photos of your shoes with the various colors! So cool!